SRINAGAR, Jan 21: Three militants of Hizbul Mujahideen were killed in an encounter at Hapatnar forests in Charar-e-Sharief area of Central Kashmir’s Budgam district today. A joint operation was launched by Army’s 53 RR, SOG and CRPF in forest area of Hapatnar this morning following credible inputs about the presence of militants. As the security forces intensified the combing operation, militants hiding in the area opened fire triggering off a gunfight which continued intermittently till late in the evening. Three bodies have been recovered along with arms and ammunition. Sources identified the killed militants as Manzoor Ahmad Kar of Sirnoo, Pulwama, Shahid Baba of Drabgama Pulwama and Hilal Ahmad of Begumbagh Kakapora, Pulwama. Clashes erupted in South Kashmir’s Pulwama district amid a shutdown following a gunfight between militants and the security forces in Budgam. 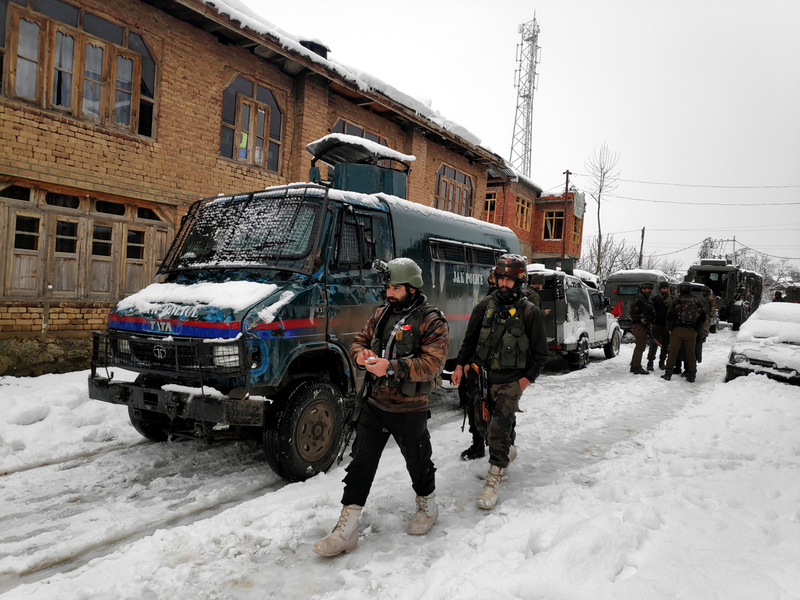 The area observed a shutdown while youth clashed with the security forces soon after the rumours of the killing of militants spread in the area. Clashes broke out at Rajpora Chowk, Murran Chowk and Kakapora areas of the district. Authorities suspended the internet service in Budgam and Pulwama districts soon after the gunfight broke out. A police spokesman said here that based on credible inputs about the presence of militants in Hapatnar area of Chrar-i-Sharif in district Budgam, a cordon and search operation was launched today jointly by police and security forces in the area. “Three militants were killed and the bodies were recovered from the site of encounter. Their identities and affiliations are being ascertained. Police has registered a case and initiated investigation in the matter. Incriminating materials including arms and ammunition were recovered from the site of encounter”, the spokesman added. “Citizens are requested not to venture inside the encounter zone since such an area can prove dangerous due to stray explosive materials. People are requested to cooperate with police till the area is completely sanitized and cleared of all the explosives materials, if any”, the spokesman added.